Word on the street is that the 2016 Nissan Pathfinder offers some of the best performance specs available, with a massively powerful engine and a system capable of realizing epic levels of fuel efficiency. At the same time, rumor has it that this vehicle is also phenomenally sophisticated, offering drivers a range of exciting technology systems to keep you informed and entertained. Well, in addition to all of this, we want you to know that the 2016 Nissan Pathfinder also provides an array of carefully designed safety devices to keep you as secure as possible on the open road. Just read on for some of the details. First of all,the Pathfinder is equipped with a dynamic airbag system that features dual-stage supplemental airbags, driver and front passenger-seat mounted airbags, and roof-mounted curtain-side impact supplemental airbags with rollover sensors, among others. But that’s just the beginning, because the Pathfinder also features Dynamic and Traction control systems to ensure your stability and optimize your traction when you’re operating at high speeds on the highway or in challenging weather conditions. 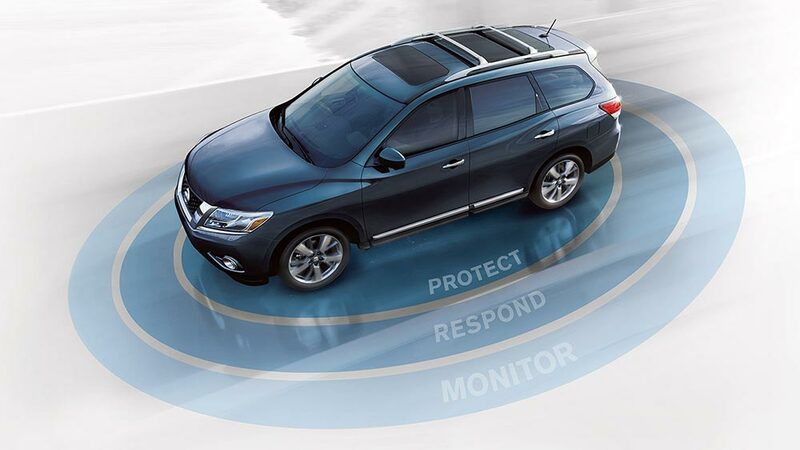 At the same time, the Pathfinder is outfitted with a Rear-Cross Traffic Alert system that alerts you to the presence of vehicles that are about to cross your path from behind, allowing you to avoid collisions and other threats to your safety. And with a Blind Spot Warning system, the Pathfinder can alert you to the presence of vehicles in your blind spot, thereby allowing you to more easily avert potential accidents and improve your knowledge of the area surrounding you. Finally, the Pathfinder’s Rear View Monitor system makes parallel parking a breeze by giving you a comprehensive image of the area to the rear of your vehicle, enabling you to negotiate even the smallest spaces. Test Drive the Nissan Pathfinder Today! The best part is you can take the Pathfinder out for a drive today simply by stopping by our Sorg Nissan dealership. Located at 2845 N Detroit St in Warsaw, we can also be reached at 574-267-5850 or even contacted using this easy-to-complete online form. Delay no longer: visit Sorg Nissan today to experience the best in automotive safety!